Differential type flow meter is the most widely used flow measuring device for low viscous fluid in a pipeline that requires an accurate measurement at a reasonable cost. These types of flow meters are generally simple, reliable and offer more flexibility than other flow measurement methods. The most common differential pressure flow meters included Venturi, Orifice, Flow Nozzle, Pitot tube, Dall type. In differential pressure flow meters, a restriction is introduced into the pipe, which results in a pressure drop across the constraint. 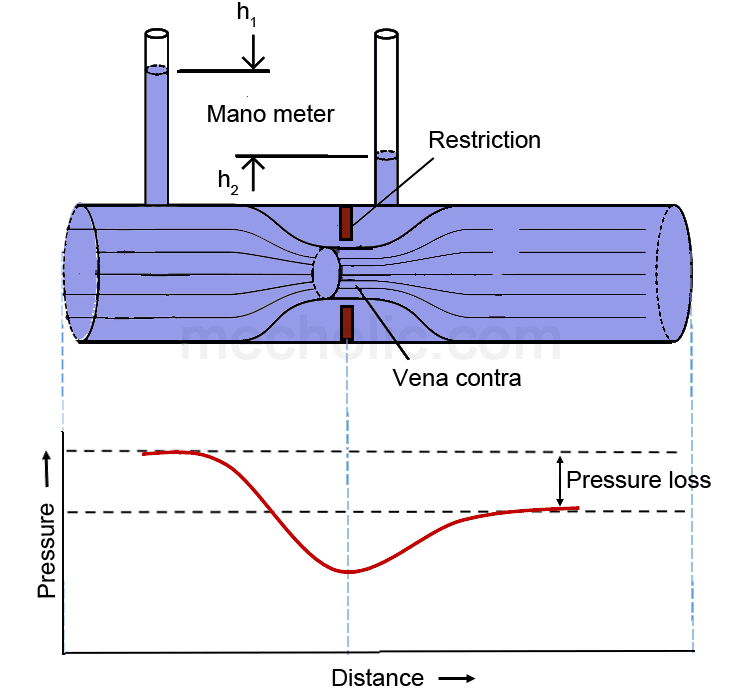 When such a restriction is placed inside the tube, the velocity of a fluid increases after the constraint, hence the pressure after restriction decreases. The developed differential pressure or head is measured, which provides an indication of flow rate. So the differential pressure flow meters also called head meters. This is shown in above fig. Vena contracta – Smallest cross-sectional area of the flow stream. At vena contra velocity is maximum, and pressure is minimum. Read: What is vena contracta? How vena contrata formed in fluid flow? These types of flow meter always consist of two components, Primary devices, and Secondary devices. 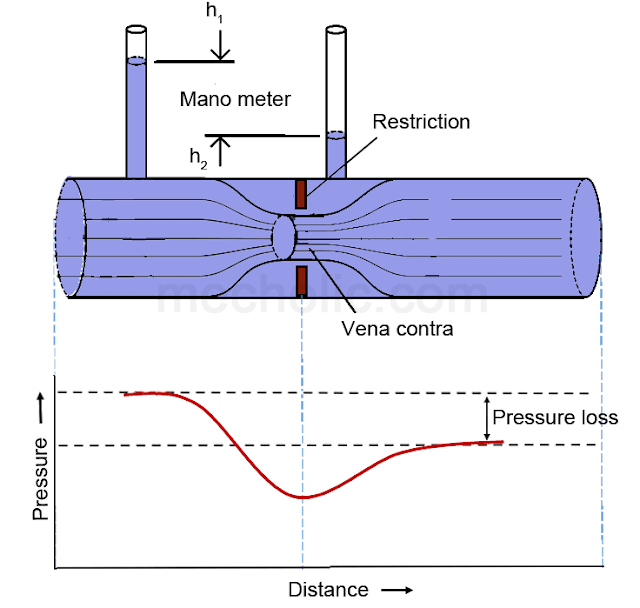 The primary device is placed in the pipe to restrict the flow and hence to develop a differential pressure. They are an orifice plate, venturi, flow nozzle, dall tube, pitot tubes, annubar tube, elbow tap, flume, etc. The secondary device measures the differential pressure and provides a readout or signal for transmission to the control system. They are manometers, bellow meters, force balance meters, ring balance meters, etc. With restriction flow meters, calibration of the primary measuring device is not required. The primary device can be selected for compatibility with the specific fluid or application, and the secondary device can be selected for the type or readout or transmission signal desired. They are adaptable to different flow rate and pipe sizes. They can configure in the bidirectional flow. Suitable for measuring the flow rate of both liquid and gas. Reliable, this device is maintenance–free (very low maintenance) as it has no moving parts. It is available in a wide range of sizes. Causes relatively high permanent pressure drop. Flow rate rangeability is low because of the square root relationship between flow rate and pressure head. Difficult to measure the flow rate of pulsating flow. It may cause condensation and freezing at the connecting piping. It cannot measure low flow rate. Accuracy depends on the pressure sensor. Accuracy depends on many other fluid characteristics such as temperature, compressibility, specific gravity, etc. Difficult to use for flow measurement of slurries. What is the minimum working flow rate of dp flow meter??? ?